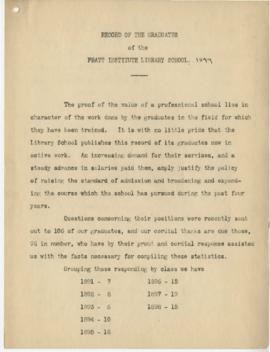 The School of Information records, maintained by the administration, document the academic activities of students and administration at Pratt Institute School of Information from 1890 to 2015. This includes administrative correspondence, institutional reports, curricular resources, student statistics, and student works. Also included are faculty works, publications, and general course materials. 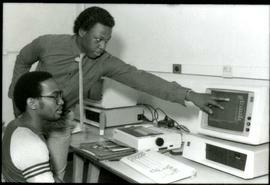 The School of Information administration also maintained student files that contained records from their attendance in the program in addition to documentation of notable work accomplished in the field after graduating. These series were adapted from Ian Post's finding aid, Guide to the Records of the School of Information 1886-2001(July/August 2015). 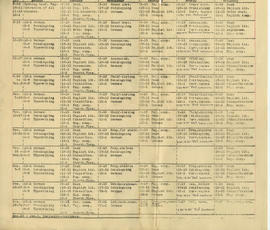 Some sub-series in Post's finding aid were not relevant to parts of this collection; therefore, these sub-series have been skipped in this finding aid in order to preserve the identification numbering from Post’s finding aid to prepare them for reintegration into the Pratt Brooklyn Archives. A number of series and sub-series were created in order to accurately identify materials in this collection. These were processed as part of an ongoing project. Original order is uncertain as it is possible that the researcher who held onto the records for 16 years may have attempted to arrange them in a loose chronological order. Arranged in 9 series: 1. Reports, 1894-2015. 2. Administration, 1890-1991. 3. Publications, 1927-1990. 4. Publicity, 1890-1997. 5. Curriculum Materials, 1890-2015. 6. Student Materials, 1894-2015. 7. Alumni, 1890-1997. 8. 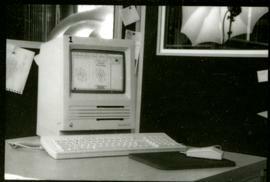 Audiovisual, 1987-1990. 9. 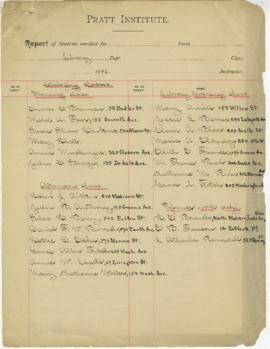 Student Records, 1890-2015. The records are arranged in nine series, which have been further arranged into sub-series. 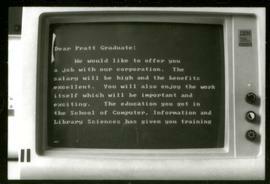 Some of the materials in the Pratt Institute School of Information records have been relocated to the Pratt Brooklyn Archives, while others remain in the Manhattan Archives. Therefore, it was necessary to split sub-series to indicate the separate physical locations of materials. These splits are indicated by the “a” or “b” following the sub-series’ identification numbers (“Identifier” in AtoM) and the date or date range following the title of the sub-series. 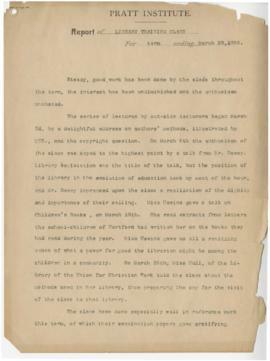 There were a number of instances where the sub-series was unique to one archive or the other, in which case “a” or “b” are not used in the identification number and the date or date range is left out of the title. Records designed for public use (e.g., course descriptions, faculty listings, etc.) are available to researchers upon request, with some such select records available through this online finding aid. Other records are available to researchers 20 years after creation. 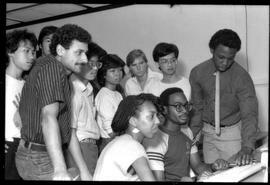 The Pratt Institute School of Information On-site Archives and Special Collections is open and available for access from Monday to Thursday from 11am-3pm during the Fall and Spring semesters, by appointment only. To request materials, please contact Anthony Cocciolo at acocciol@pratt.edu. 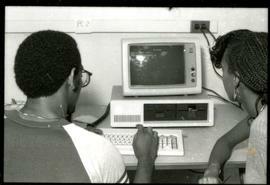 The School of Information administration maintained student files that contained records from the student's attendance in the program in addition to documentation of notable work accomplished in the field after graduating. A portion of these records had been recovered after being temporarily removed from Pratt Institute by a former professor in the early 1970s for a project on the history of the school that was not completed. The box was returned 16 years later. A letter from the researcher accompanied the box, detailing that it had been "swept up" with other belongings and stored in an air-conditioned storage space for the duration of that time. The letter specifies that these records were in an "Annual Reports" file. 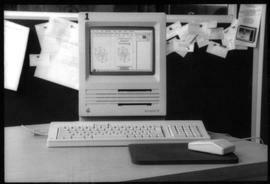 This collection will eventually be integrated back into the Records of the School of Information 1886-2001 at the Pratt Institute Archive at the Brooklyn Campus.